The popularity of pet clothing has increased in recent years. You can find a large selection of clothing especially designed for pets. Indeed, clothing for pets can be found at most pet stores. And it comes in different sizes, styles, colors, designs, and prices. You are sure to find the perfect piece for your pet. Now, I was very aware of the popularity of dog clothing. Who hasn’t seen dog sweaters, dresses, and coats? These pieces are so cute. However, finding clothing especially made for cats came as a surprise. Cats are not particularly fond of wearing clothes. Believe me, I’ve tried. They’re not, in general, as willing as dogs are. But sometimes, you may find a special kitty who will enjoy wearing a fancy dress. 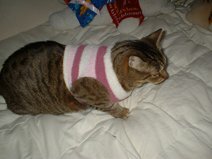 Before I learned about cat clothing, I bought a small dog sweater for my cat. However, even though it came close, it was not a perfect fit. So I started looking for clothing that was especially designed for cats. And I found it. Why would a cat wear clothing? Would a cat wear clothing? Most would not, of course. So, it would depend on your cat's needs and your preferences. And ultimately, it will depend on your cat's willingness to get dressed. Most pet lovers I know dress their pets (most of them dogs) for fun. Dressing your pets during the winter season is a good idea to keep them warm. 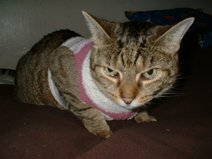 I bought a sweater for one of my cats because she suffers from a respiratory condition, and the cold weather is tough on her. So whether it is for fun or for practical reasons, you can find the perfect piece for your furry friend. Here's Mia wearing one of her sweaters. She's really looking pretty. Cat sweaters: You can make them yourself or you can buy them. Cat coats: For the rain and for the cold weather. Cat dresses: Your kitty will look so elegant in these. Halloween costumes: There are many designs to choose from. I've also found cat vests and cat jackets. The cat jackets I've seen serve double duty: as "coats" and as harnesses. These are very practical pieces of clothing indeed. You can also find made-for-cat accessories, such as bandanas, collars, harnesses and leashes. Your cat can certainly look stylish. Do you know how to knit or crochet? You could make your kitty unique and original sweaters. You can find several patterns online. Some you have to buy, but some are free. I'm sure your cat will love her one-of-a-kind sweater, and you'll have so much fun designing it. Pet clothing is a wonderful cat lover gift. You cat give a piece of clothing as a separate gift, or you may include it in a gift basket. If you want to splurge, give several pieces! You can also give a gift of cat-inspired clothing to your human friends. There are many options to choose from: jackets, t-shirts, socks, sweatshirts, and much more. Here's more information about cat clothing. Another great idea is to give a cat clothing gift to both, your friend and his/her cat. They'll both be delighted.